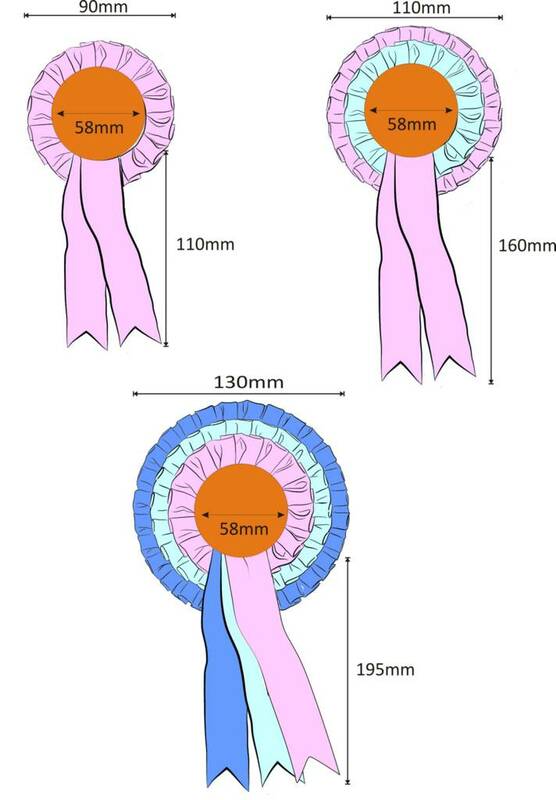 Dimensions of our 1-tier, 2-tier and 3-tier rosettes - essential information before you buy customised rosettes. 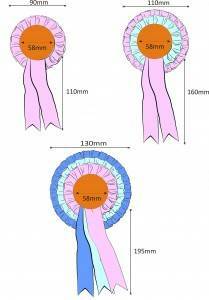 This diagram will give you an idea of the various sizes for our rosettes. Each rosette will be custom made to your requirements. The diameter of the rosette is fixed and is dependent on the number of tiers of ribbon. The individual tiers can be any colour. All the ribbon that is used on our rosettes is box-pleated. This gives a very full pleat which in turn produces a very high quality rosette. One of the best reasons why you should buy your rosettes from us. The illustration shows the standard arrangement of tails but they can be customised to your wishes. Length, colour and number. When you decide to buy customised rosettes, the first thing that you will need to do is to specify the centre of the rosette. This is based on a 58mm badge which is fixed to the centre of the rosette. The centre of the rosette can contain a photoghraph if required. Or it can be printed in full colour. On the order page you will see an image which is titled rosette previewer. Here you can choose a generic image of your chosen badge design. Then one by one you can choose the colour of the various tiers of ribbon for your rosette. You can then see how each of the layers match you badge colours and change them as much as you require until you are happy with the choice. When you are ready to order then you just need to accept the design. Then the details will automatically be translated to the order form, together with the details of the badge centre. We then produce the rosette exactly as you require, and attach a safety pin to the back so that the rosette can be safely attached to your clothing. 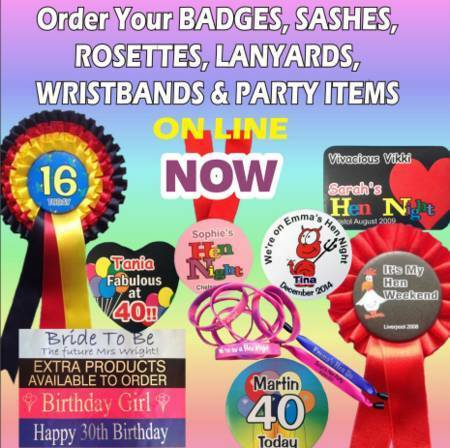 If required, then the rosette tails can be supplied in any non standard length of ribbon - and of course you can have them in any ribbon colour that suits your particular design.